I have a small linen bag of dried lavender hanging on my bedpost. The herb is said to calm the senses and help with sleep. I’m not sure if it does anything for my slumber, but I do enjoy the romantic aspect of keeping this talisman and, most of all, the scent. Ever since incorporating lavender into our breakfast biscotti, we’ve fallen for it as a cooking ingredient. If you’ve been reading this page for a while, you know that we like to keep our ice cream interesting, having tried lemon & basil and cardamom ice cream. 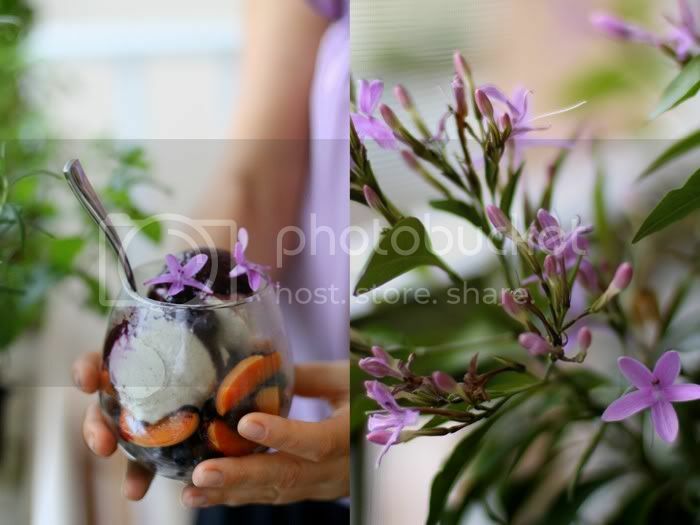 Thus, preparing a lavender sundae was the next logical step in our ice cream adventures. 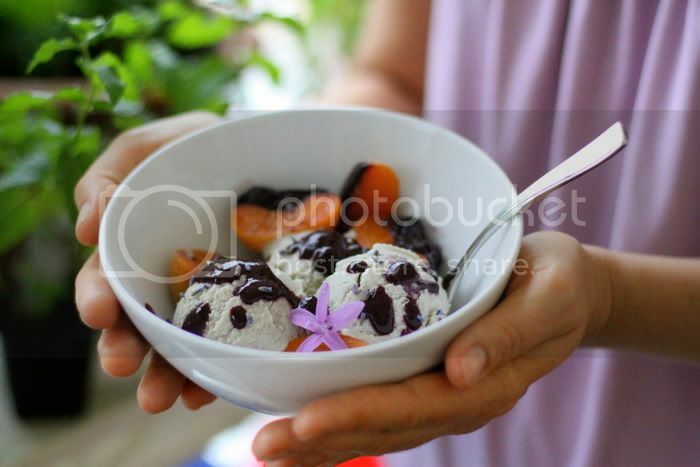 The “poached” apricots in blueberry sauce add a nice freshness to the smooth, aromatic ice cream. As you might have guessed, the pictured flowers are not lavender, but we are hoping to soon get some seeds and grow this wonderful herb. In a high speed blender, combine all the ingredients until smooth. Chill well and put into an ice cream maker for 25 minutes or however long your brand of ice cream machine suggests. In a food processor or high speed blender, puree 1 1/2 cups of the blueberries, adding agave or honey until the desired sweetness is achieved. Transfer to a bowl and mix the remaining 1/2 cup of whole blueberries into the puree. Cut the apricots in half, lay them out on dehydrator trays, and cover with the blueberry sauce, reserving some puree for assembly. Dehydrate at 115F for 1-2 hours. 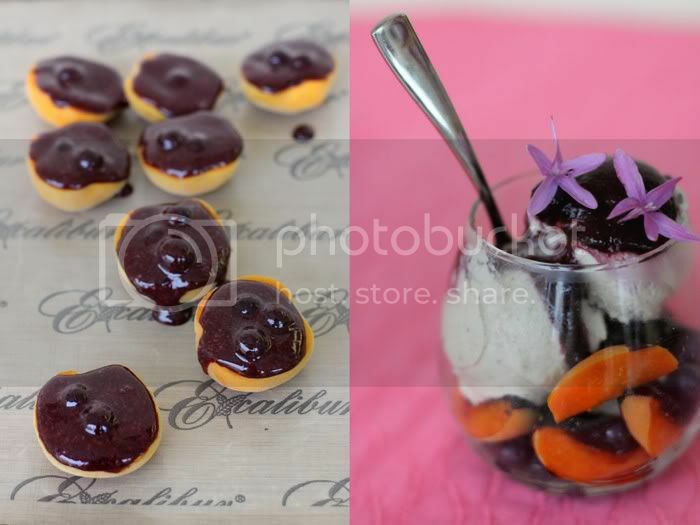 Cut the apricots into wedges and serve with the ice cream and remaining blueberry sauce. I just love this blog. You guys always have the most amazing recipes and photographs. Didn’t think you could top the last ice cream dish, but you did! Awesome stuff, bet it tastes heavenly. That looks lovely…too pretty to eat. Ok, I would eat it!!! Looks lovely, absolutely gorgeous. And a good recipe for a hot summer day. Oh wow!! This looks amazing! This looks absolutely delicious. I love vegan ice cream and I love things that have been lightly flavored with lavender. I bet this is going to be delicious…and I can’t wait to test it out! I just love this place…and recipes, and all…Thanks for existing!!! Can’t believe that I missed this gorgeous recipe!